Starbuck also lovingly known to everyone as Bucky. Steve and Wendy would have never guessed that Bucky would be such a great dog in every way. He started pulling in the 2000-2001 pulling season. At his first competition he was totally out of control. He did not like that cart. Bucky finished in last place pulling only 300 pounds. So, on the second day, he was carried in and finished in 4th place. What a difference, but what did Steve and Wendy start! He was carried in for the rest of his career. Bucky loved pulling and there was no stopping him. He would hit with so much force and then just go. He was just so very fast. Bucky had so much heart, that's why he did so well. Not from training, but because of heart. He may not have won every time, but he would give you his all. It was only when he got older that he would "act". He was pretty good at acting too. He would give a fake little hit and he thought he had everyone fooled. Except a lot of times the cart was still moving. It would make everyone laugh. Bucky would always put his front feet on Steve's chest; he was so gentle when he did this. He loved this time; just him and Steve, Steve petting and talking to him. 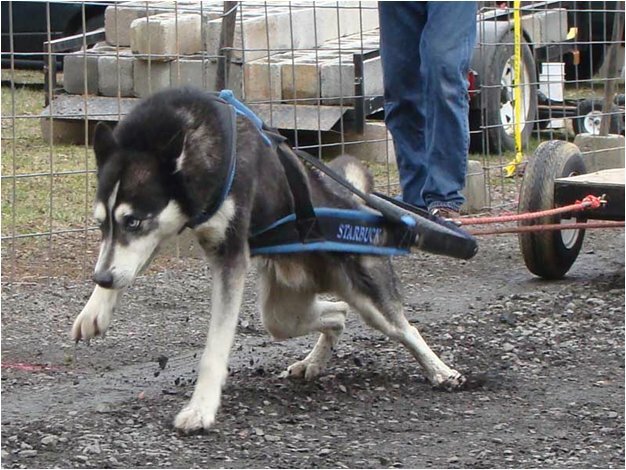 After he pulled, he would hold his head high, tail up and wagging, prancing back to the holding area. They were truly a team. One time Bucky thought he had to save Steve. You see, Bucky was having a hard time making the pull until Steve fell off the end of the track. All of a sudden, Bucky broke the sled loose and "rescued" Steve. He was there before Steve could get to his feet. Bucky has been qualified for all twelve Championships of his career. He has been to all except for the first one that he qualified for in 2001. He missed it because Steve had a broken leg and could not travel. It would be because of the handler. Starbuck's received many medals in his career. They are as follows. In 2009 he received two gold medals at the Championships hosted in Michigan. In 2010 it was fantastic to have him on the medal stand with his son, Mole, in Enfield, CT.
Starbuck's last Championship was in 2012 at Post Falls, Idaho. He came in 4th place on snow, behind his two sons Mole and Junior. Not too bad for a 12 year old. It was an emotional pull knowing that he was done, but what an awesome career. We have all had wonderful dogs in our lives and this is one of Steve and Wendy's. The IWPA Board of Directors reviewed the application and unanimously voted to induct Starbuck into the International Hall of Fame.